I know of an Indian restaurant that has a dish called the Exotica Special. When I first read it, I didn’t know what it was. However, the dish has a description beside it: Exquisite dish of sustainably caught North Atlantic King Prawns, free range chicken, Scottish beef and organic pork combined with a delicious mixture of just picked garden vegetables and cooked in my family’s famous Spicy coconut curry sauce. Mmmm, that sounds very tasty indeed. Despite not knowing what it was at first, I found this dish interesting because of the description. Not surprisingly, this particular restaurant sells a lot of Exotica Specials, both through its website and in the restaurant. Put simply, dishes with descriptions sell much better than those without. My advice comes with a word of caution though. Don’t just list the ingredients. Use words like delicious, sumptuous, award winning, certified, ground by hand, organic, free range, light, fresh or spicy. For your special or “authentic” dishes, stories add to the appeal: “my grandmother taught my mother this dish when she was a girl” or “a famous dish from my hometown” or “served only at festivals”. Everyone loves a good story, especially about their food! I have spoken with dozens of restaurant owners who want to add as many dishes as possible to the menu. They don’t want to miss a single order. When I analysed this idea, the results were clear: short menus are profitable menus. Only put the popular dishes on your menu because they’re the ones people want to buy. Unpopular dishes just confuse and discourage customers. Think also about the best way to organise your dishes by category. This is even more important for the website than for your printed menu. Keep it simple and make it easy for customers to find your popular dishes. If you offer a dish in two versions, the premium and more expensive version often sells well, especially if you highlight it. So you might offer a Super-Size Nan for 50 pence more than the plain Nan. Equally, take a look at all your popular dishes to see if you can offer an upgraded version. You could offer duck instead of chicken or king prawns instead of prawns and so on. Present both choices, but describe the premium and more expensive one best. Your profits will improve as a result. Customers need to buy extras like drinks, desserts and sauces in addition to the main dishes they were going to order anyway. A small but useful range of these items on your takeaway menu and website will definitely drive up your average order value. You just read some ideas about how to improve your menu’s performance. Now it’s time to put those ideas into action. To refresh your memory, here were the key points. Step 1 – Start with a copy of your menu, a piece of paper and pencil. If the answer is “because I may miss an order – delete it. 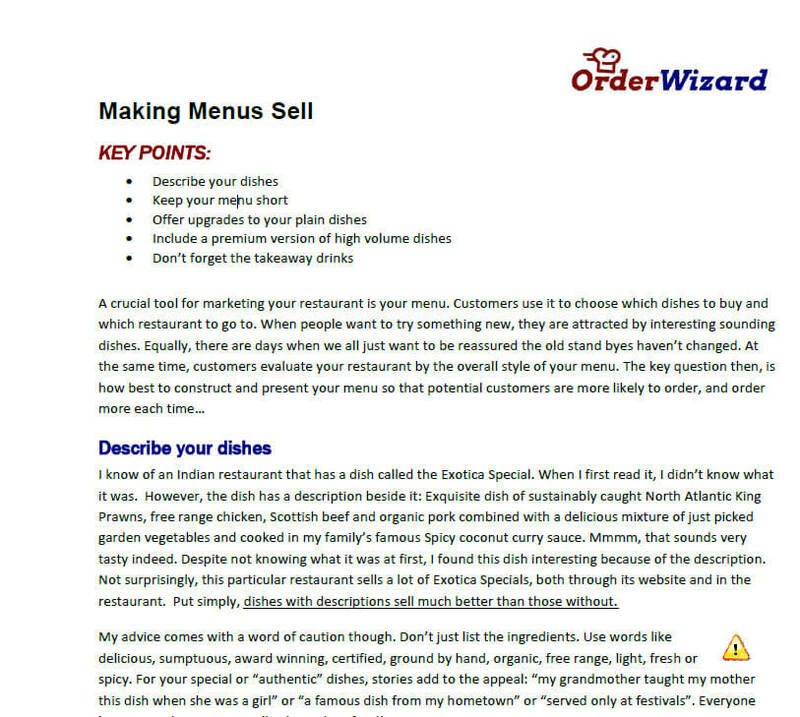 Step 6 – Ask yourself whether you can create a premium version for the top dish in each menu category. If yes, create it and write a fantastic description for why people should try it. Step 9 – Do you have a drink list on your takeaway menu – yes or no? I know. This is killing you. Do it anyway.